Technics headphones return to mark 40th anniversary of SL-1200 turntable | What Hi-Fi? 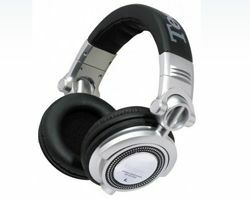 Panasonic is to re-release its popular line of Technics Pro DJ headphones to commemorate the 40th anniversary of the iconic SL-1200 turntable, which launched in October 1972. A favourite amongst DJs, the RP-DH1250 and the RP-DJ1205 headphones will be left pretty much untouched on the inside but will now come in “sleek new packaging”. The headphones promise top-notch sound quality alongside a flexible design that enables you to twist both earphones, ideal for amateur and pro DJs alike. Water-resistant and with a closed-back design, the Technics RP-DH1250 and the RP-DJ1205 headphones offer 3,500 mW power handling capacity and claims a 5Hz-30kHz frequency response to deliver high volume with minimal distortion. A 24k gold-plated stereo plug is bundled with the cans, reducing signal loss and adding a nice aesthetic touch. Currently available for pre-order on Panasonic.com in the US, the RP-DH1250 has been listed at $270 with the RP-DJ1205 priced at $230, with both due out in October 2012. We're waiting on news of a UK release from Panasonic. The Technics SL-1200 series of turntables was launched in October 1972 by Matsushita, which became the Panasonic brand, under the Technics name, and finally discontinued in 2010. Originally released as a hi-fi record player it quickly became the industry standard among radio and later club DJs, thanks to the direct drive high torque motor design, which made it robust and reliable.